If there ever was a ‘silly season’ for news, it seemed to have been ignored by the Daily Post in North Wales. … screamed its front page on Thursday 27 August, cleverly using those three words to grab readers’ attention by telling a court story in a different way. It worked for me: I was actually perusing weeklies in the Beddgelert newsagent, but bought the Post on the strength of that headline. The sub-heading went on to tell how a village postmaster and his wife ‘threw meat scales at masked pair before they escaped in disability car’ during the raid in Llangernyw, near Abergele. The daily’s full story on page five then took readers in yet another direction with the tempting headline: ‘I wish I’d hit him harder’. The in-depth court report – from 82-year-old veteran agency operator Derek Bellis – then ran over 26 paragraphs, and included a picture of the local heroes behind their counter. This is the way to project, tell, retell and package such a good story, and it was impressive to see a daily paper in 2015 doing this several times on the same day – and all starting on page one. … did it again, the full story on how the hoard of ancient coins had been discovered in a field running on page six. All three of the above boosts could have made a splash on a different day, and the way they were packaged on page one pointed to an acute sense of news at the Post. ‘That’s what newspapers are supposed to do’, some might say, but I think it’s a skill far too often removed from the front pages of regional dailies. ‘Seagulls’ licence to attack’ leading page 12, with the sub-heading ‘Cash-strapped councils can’t afford to tackle the menace’. I’m sure the paper was newsy under Mark Thomas, its former editor until earlier this year, but it’s reassuring to know that standards are being kept high by new editor Andrew Campbell. 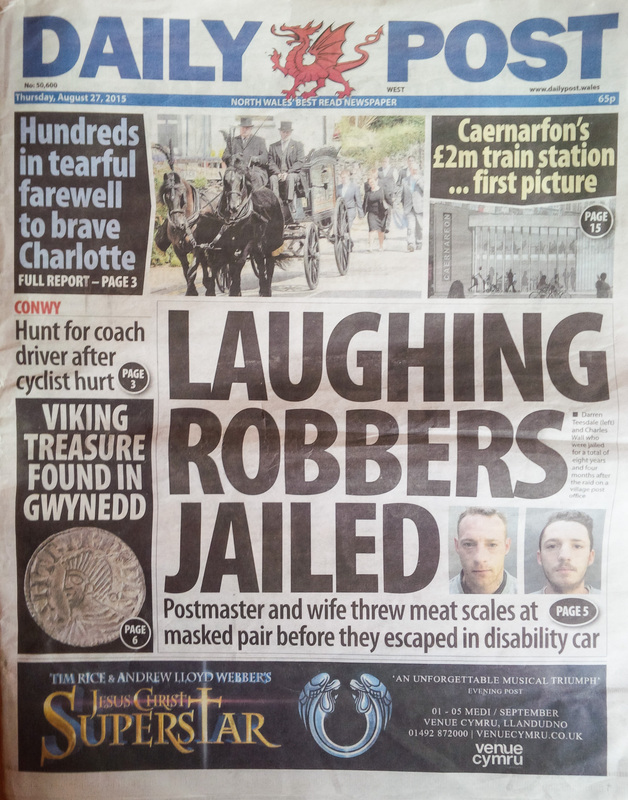 Also impressive was the Post’s long list of patch reporters, reminding readers who’s charged with covering their local areas: four for Gwynedd, three for Conwy, two for each of the Anglesey, Wrexham and Flintshire areas, and one for Denbighshire, as well as specialists covering politics, business, arts and farming. Does all this make a difference? Well, it’s certainly no surprise to find the Post’s sales are holding up relatively well in comparison to most regional dailies. They’re still falling, of course, but this has consistently been single percentage declines, and the remaining circulation of 24,505 (98pc paid-for) sounds good going for a paper that’s spread across such a rural area, especially when its Liverpool twin sister went weekly in 2011, eventually closing nearly two years ago. If anything can be criticised, I thought the Trinity Mirror-owned Post, with a cover price of 65p, was a little thin for a Thursday, although its 48-page book managed to carry around 200 reads on 40 editorial pages; and the next day’s edition was a much-thicker 72 pages. At a time when so much attention quite rightly has to be invested into digital development, it was refreshing to see a daily regional so committed to displaying its printed news. Fair comment on the whole but the trouble is the vast majority of the Daily Post’s main news content goes online the day before it appears in print, sometimes basically word for word. I know that’s the way the industry is going anyway and they do a good job with their online content, but the DP – probably in line with other Trinity Mirror titles – seems very much a digital first effort and I do wonder if the print version will ultimately suffer as a result.